This article is about UNSC naval commander and the daughter of Jacob Keyes. For other uses, see Keyes (disambiguation). "Until we kill Truth, stop the Rings from firing... nothing else matters." Commander Miranda Keyes, born Miranda Halsey (service number 15972-19891-MK), was the commanding officer of both the UNSC In Amber Clad as well as the UNSC Forward Unto Dawn. She was also the commander of the human expedition force to Installation 00 in late 2552. She was the daughter of the late Captain Jacob Keyes and Doctor Catherine Halsey. Dr. Halsey's sketches of a young Miranda. A sketch from Halsey's journal depicting Miranda with her father. Miranda Halsey was born in 2525 to Catherine Halsey and Jacob Keyes. She lived with her mother on Reach until 2531 at the age of six, when she was sent to live with her father because her mother felt that she could not provide the care her daughter deserved. In the following years she changed her last name to Keyes. She would live in an apartment at Mare Insularum on Luna, where her father taught at the Academy at Mare Nubium, or Luna Officer Candidate School. Dr. Halsey attempted to dissuade Miranda from joining the UNSC military, to no avail. Miranda was accepted to the Academy's pre-enlistment training at age 16, being the second-youngest to ever have attended the school. After graduating with honors, she immediately requested assignment to active duty. She was assigned to the UNSC Hilbert, an older, unarmed science vessel patrolling the outer reaches of UNSC-controlled space. This was due to her mother's influence, who wanted to keep Miranda out of harm's way. Despite this, the ship was used by Keyes to play a critical role in the Battle of Gamma Pavonis VII, ramming the Hilbert into a Covenant destroyer. Keyes was one of two of the ship’s crew to make it to the escape pods. 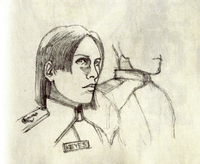 In the following years, Keyes spent most of her time in the front lines, playing a crucial advisory role in the coordination of several major offensive strikes against Covenant targets. This proved invaluable to her as she quickly rose through the ranks of the UNSC. Throughout her career, she was forced to confront accusations of nepotism from those who ascribed her rapid rise in rank to the position and influence of her father, Jacob Keyes. Throughout her life, Miranda harbored a resentment for her estranged mother, and she stopped answering Halsey's letters at one point after having her name changed. At some point while she was a Midshipman, she sent her mother a message, stating that she was somewhat aware of what Dr. Halsey had done. She promised to keep who her mother was a secret, simply because she didn't want her father associated with what she had done. She ended the message promising to make sure she would take after him. A rare exception to her silence was when she invited her mother to her promotion ceremony, although Halsey did not come. According to AI Black-Box, Miranda kept a journal like Halsey did, and wondered how Dr. Halsey would feel if she read it. In April 2550, Miranda was promoted to the rank of Lieutenant Commander in a promotion ceremony at downtown Quezon on Reach. Fleet Admiral Terrence Hood also personally awarded her the Silver Star, and it was announced that she would assume command of the Stalwart-class light frigate UNSC In Amber Clad. Immediately following the ceremony, Keyes was deployed back to active duty, having been able to postpone a mandatory leave required for those receiving high-ranking promotions. In 2552, she accepted her father's posthumous Colonial Cross on Cairo Station immediately before the Battle of Earth. At this time, she was assigned to the Medii Battle Group of the UNSC Home Fleet. By this point she had achieved the rank of Commander at a young age. Commander Keyes receiving her father's posthumous Colonial Cross from Fleet Admiral Hood. At the start of the Battle of Earth, Miranda's vessel was docked at Cairo Station, so that she could receive her father's honors. During the awards ceremony, the station was attacked and boarded. Miranda fought her way to her ship with the help of Sergeant Major Avery Johnson, several Marines and the Master Chief, the latter of whom also repelled Covenant boarders along the way. As the Covenant armada began the invasion of Earth, she took In Amber Clad down to New Mombasa, where she dispatched multiple Pelican dropships with Marines to join the massive battle with the Covenant in progress there. During the battle, In Amber Clad was one of the only vessels close enough to follow the High Prophet of Regret when his assault carrier, Solemn Penance entered slipspace inside the city. "So, this is what my father found..."
Miranda reaching for the Activation Index. The In Amber Clad "piggy-backed" the Prophet of Regret's assault carrier through slipspace and ended up at Installation 05 in the Coelest system. Unable to engage the assault carrier by herself, she sent a platoon of Orbital Drop Shock Troopers to assist the Master Chief in his pursuit of the Prophet of Regret in order to capture or kill him. Once she learned of the Prophet of Regret's plan to activate Delta Halo, she ordered the Master Chief to assassinate him. Miranda sent orders for Johnson and his Marines to get the Activation Index before the Covenant could. Later, Keyes and Johnson went to the Library of the installation, accompanied by most of the standard Marines of the ship. They attempted to retrieve the Index, and, although Keyes was successful, most of the Marines were killed or infected by the Flood that were infecting the installation. Once Keyes and Johnson had the Index, they were ambushed by Arbiter Thel 'Vadamee. Johnson was knocked out, but Keyes was able to take down Arbiter's shields by wielding M7 SMG before also being knocked unconscious by Tartarus' Fist of Rukt. Seconds later, Keyes and Johnson were taken from the Arbiter by Tartarus and his band of Jiralhanae. The Jiralhanae then took Keyes and Johnson to High Charity, where they met the remaining High Prophets of Truth and Mercy. They were then taken aboard separate Type-52 Phantom dropships and were transported to Delta Halo's surface to aid in the activation of the installation. Keyes was taken to the Control Room of Installation 05 because she had been designated as a Reclaimer by 343 Guilty Spark. Tartarus then used her to begin the Installation's activation sequence. Shortly afterward Thel 'Vadamee and Johnson arrived, and the three of them were able to kill Tartarus. At that moment, she retrieved the Index and stopped the Halo from firing. However, Spark revealed that the shutdown activated a failsafe system; the rest of the Halos were set to standby mode, and could only be activated remotely from what Spark informed them was "The Ark". After the Arbiter asked him its location, Spark gave them coordinates to Earth. The release of the Flood from the ring, however, would put their plans to get to Earth on hold. The new allies would rendezvous with the Arbiter's comrade, Rtas 'Vadumee, now shipmaster of the recently-captured assault carrier Shadow of Intent, flagship of the separatists' fledgling Fleet of Retribution. Together, they formulated a plan for sterilization and quarantine. Spark remained with the fleet to coordinate containment efforts while Keyes, Johnson and the Arbiter raced back to Earth aboard one of the fleet's vessels to warn humanity and to locate the Ark. Miranda: "Now, the Prophet of Truth is looking for something called 'The Ark', where he'll be able to fire all the Halo Rings. If he succeeds, Humanity, The Covenant, every sentient being in the Galaxy..."
John-117: "The rings will kill us all." Commander Keyes with Thel 'Vadam, Avery Johnson and the newly-retrieved John-117. Upon their return to Earth around November 15, 2552, Keyes took up command at the base Crow's Nest outside of the town of Voi, near the location of the supposed Ark, undergoing excavation. Truth's Forerunner Dreadnought arrived two days later, landing directly on the artifact while John-117, who had secretly stowed away during its departure from High Charity, bailed out into the Tanzanian jungle. Johnson and the Arbiter recovered the Chief and extracted him back to Crow's Nest, where Keyes detailed her plan to have the Spartan lead an effort to neutralize one of the AA batteries defending the excavation site in order to allow Lord Hood's ships to attack the Dreadnought. However, the base suddenly came under heavy Covenant attack and as it was overrun, Keyes and the command staff evacuated the wounded Marines and escaped on the last Pelican. A large explosive device that Keyes ordered left behind was detonated by the Master Chief, destroying a large portion of the attacking Covenant and most of the base itself. Keyes supported the offensive towards Voi from Pelican Kilo 23, from which she dropped off supplies for the Master Chief. While pushing into the main town of Voi in an attempt to stop the Prophet of Truth from activating the now fully uncovered "Ark", Keyes spotted a single Covenant battlecruiser coming towards Earth. However, Hood decided to ignore it, stating that they woild not have another shot at stopping Truth. After Truth succeeded in opening and retreating through the Portal outside Voi, the battlecruiser that Keyes had spotted was revealed to be infected by the Flood. It crash-landed near the Portal and the Flood began to spread throughout Voi. Keyes came up with a plan to overload the battlecruiser's engine core to destroy the city and the Flood. Keyes was contacted by the Sangheili of the newly-arrived Fleet of Retribution and informed that Cortana was seemingly aboard the cruiser. The Master Chief found the small data unit seemingly holding Cortana, but it was simply a damaged holographic message. As the Sangheili began to partially glass Voi to destroy the Flood, John-117, Keyes, Johnson, Hood, the Arbiter, Rtas 'Vadum, and 343 Guilty Spark met aboard the Shadow of Intent to discuss the current situation. After Guilty Spark repaired the Covenant storage unit, Cortana's damaged message implied that the solution to the Flood was through the Portal. At Keyes' insistence, Hood allowed her to go through the Portal, donating his personal flagship, the UNSC Forward Unto Dawn, to aid the Fleet of Retribution in the expedition. "We have priorities, too. Until we kill Truth, stop the Rings from firing... nothing else matters." Keyes and the rest of the expedition force arrived at the real Ark--Installation 00--on December 11. Although the Dawn was unable to best Truth's fleet in direct combat, Miranda was able to fend them off long enough to reach the Ark. During the Battle of Installation 00, she landed troops and large quantities of weaponry and armor on the Ark, largely to supplement John-117's search for the Cartographer facility. Throughout the battle, she worked with Guilty Spark and 'Vadum to fight off the Covenant forces. Although Guilty Spark wished to find terminals near the core of the installation to aid in the repair of Cortana's storage unit to find the solution to the Flood, Keyes and 'Vadam agreed to focus on eliminating the Prophet of Truth to prevent the firing of the Halo Array. When John-117 located Truth at the Ark's control room, she dispatched several Pelican dropships to deactivate the shield protecting the Citadel. During the process, Keyes lost contact with Johnson and his Marines due to their capture by Jiralhanae forces. Though the UNSC and the separatist forces were able to deactivate the shield, the battle was interrupted by the sudden appearance of the Flood-infested High Charity. The Shadow of Intent suffered heavy damage upon the Flood's arrival, and was unable to open fire on the Citadel. Guilty Spark tried to convince the group to contain the Flood outbreak before it could spread, but Keyes insisted that stopping Truth was more important. Having no effective way to destroy the Citadel from above, Miranda ordered John-117 and the Arbiter to storm the tower and stop Truth. Miranda Keyes moments before her death at the hands of the Prophet of Truth. Realizing that John and Thel 'Vadam would never get there in time to stop Truth, Keyes decided to stall Truth herself. She crashed her Pelican into Truth's position, intending to stop the Array's firing and rescue Sergeant Johnson, who had been captured by Truth's forces. She exited her Pelican with an M90A shotgun and an M6G magnum. She was able to kill two Jiralhanae, and wounded (some fatally) several others but ultimately found herself outnumbered. Johnson demanded that she kill them both in order to halt Truth's plans. Keyes, unwilling to harm Johnson, hesitated. As she paused, the Prophet of Truth shot her in the back with a Type-25 Spiker, killing her. Her death greatly disheartened and demoralized Johnson and he didn't resist when Truth used him to activate the Ark. Truth viewed Miranda's unwillingness to kill Johnson as proof that humans were weak and unable to set aside their compassion, which was why the Forerunners had left them behind. After the Master Chief and the Arbiter stopped Truth, Keyes' body was subsequently rescued from Flood infection by Johnson, who carried her into the Pelican which he used to escape the Ark's control room. It is likely that her body was taken back to Earth, and buried there. Her face is later seen in a photograph on the Memorial to the fallen on a hillside overlooking the Portal to the Ark, near the photograph of Avery Johnson and the service number of Master Chief John-117. Due to her actions during the final months of the Human-Covenant War, she was posthumously awarded the UNSC Legion of Honor. Catherine Halsey, despite having been estranged from her daughter, mourned Miranda's death and often cried in her sleep, whispering Miranda's name to herself. Keyes with an M7 SMG. Like her father, Miranda Keyes was known for being one of the bravest officers in the UNSC. This was demonstrated by her decision to follow Regret's flagship, Solemn Penance, into slipspace during the Battle of Mombasa, when she crashed the UNSC Hilbert into the Covenant destroyer over Gamma Pavonis VII, and leading the final battle of the war, when she crashed her Pelican through the Citadel's window in a last-ditch effort to rescue Avery Johnson moments before her death. Due to her unexpected move to follow Regret's ship into slipspace, she was described by Commander Richard Lash as "the ballsiest officer in the Fleet". He further suggested that she may have been trying to live up to the reputation of her father or that she was simply "nuts". Although she and her father were not particularly close, Miranda identified with him more than she did with her mother. This is suggested by her decision to take up her father's surname after being raised by her mother. As a child, Miranda was often curious and excited about her father's assignments. While her father was serving in the Outer Colonies, Miranda would often learn about naval tactics by herself for her own enjoyment. Even at a young age, she did not require much affection from Jacob, though she did enjoy walking down Armstrong Alley with him to admire the scenery. In-game, Keyes appears as a non-playable character and is invulnerable to damage. When meleed, she won't bleed, she'll only bleed when shot at or when caught in a grenade explosion. If you do either of the aforementioned for a period of time in the Halo 2 level Cairo Station she will moan. If you shoot her for some time or melee her in Halo 3 she will scream hysterically. Check out our collection of quotes related to Miranda Keyes in its quotes page. Miranda Keyes was voiced by Julie Benz in Halo 2. In Halo 3, she was portrayed by Justis Bolding instead, allegedly because Bungie wanted Keyes to have a distinct accent. However, Keyes' voice in Halo 3 has no discernible accent. 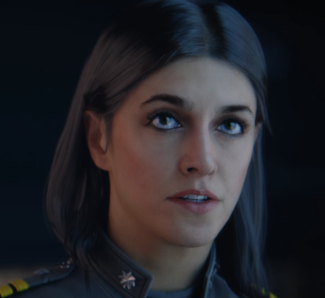 In Halo 2: Anniversary, Keyes' facial appearance is modeled after actress Courtney Munch, who also provides the motion capture for her remastered animations. Keyes would have had a larger role and a full introduction in the deleted Halo 2 level Covenant Ship, in which Keyes and a group of ODSTs would have been aboard a Covenant assault carrier alongside John-117. Additionally, one of Jason Jones' original central ideas for Halo 2 was that Miranda would betray the UNSC by forming a deal with the San'Shyuum of the Covenant, as she believed that the UNSC was responsible for her father's death. In order to get revenge against John, whom she believed directly killed her father aboard Truth and Reconciliation, Keyes would have strapped a bomb to the Master Chief's armor. Although Jones was highly insistent about including this particular plot point, Joseph Staten was not fond of the idea and "just couldn't figure out how to make [it] work". Notably, Keyes was born five days after the Human-Covenant War began and died during its last major battle. In both Halo 2 and Halo 3, she has the number seven engraved on her cheek. In Halo 2, Keyes' uniform collar bears the silver oak leaf of a commander and she is addressed as "Commander" in a formal setting. In Halo 3, her uniform's collar has the golden oak leaf of a lieutenant commander, though its shoulder boards and sleeve ends bear the three full bars of a commander rather than the two full bars and one thinner bar of a lieutenant commander. Halo: The Essential Visual Guide confirms that she held the rank of commander at the time of her death. The Halo Encyclopedia mistakenly claims that Keyes was killed by a Brute Honor Guardsman, though she was actually killed by the Prophet of Truth. Miranda Keyes in Halo 3. Full-body portrait of Miranda Keyes in her UNSC Navy dress uniform in Halo 3. Full-body portrait of Miranda Keyes in UNSC Navy dress uniform in Halo 2. Concept art of Commander Keyes in uniform in Halo 3. More concept art of Commander Keyes in uniform in Halo 3. Miranda aboard the Cairo, attempting to get back aboard the In Amber Clad. Commander Keyes at the controls of UNSC In Amber Clad during the Battle of Earth. Tartarus captures Miranda, taking the Index of Installation 05. Keyes wearing her dress uniform in Halo 2: Anniversary. Miranda observing In Amber Clad crash site. Tartarus takes Miranda to the Control Room. Miranda being held captive by Tartarus. Miranda Keyes with Thel 'Vadam and John-117, watching Truth's broadcast before the Covenant infiltration of Crow's Nest. Jacob Keyes' final memory of Miranda before he was fully assimilated by the proto-Gravemind. Miranda Keyes as seen in Halo Legends' Origins. Miranda with 343 Guilty Spark and Johnson looking at a readout of the primed Halo Array in Installation 05's Control Room. TVGuide.com: Are you all done with your voice work for the Halo 3 video game? Julie Benz: You know what? I am actually not a part of Halo 3. I was informed a couple of weeks ago that they are actually changing the voice of Commander Miranda Keyes, and giving her an accent.